Every athlete gets to a point where they feel like they’ve reached a plateau. Try as you might, you just don’t get any faster. Here’s some easy and fun ways to get a little more speed into your swimming workout. 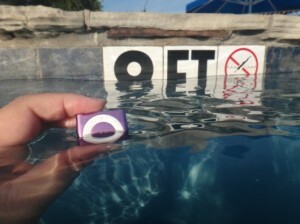 A waterproof iPod gets music underwater. Listening to moderate paced music will increase not only your speed, but makes you feel good. When researchers looked at the times of athletes who listened to no music, moderate tempo music, fast tempo and mixed tempo, the most improvement was shown by athletes listening to music with a moderate tempo. If you like a fast mix though, don’t fret, all swimmers with music swam faster than the group with no music. Many different cases and dry bags are available, or you can get a waterproof iPod or other dedicated music player. Use some basic pool tools to focus your workout and build strength. Pull buoys are a figure eight shaped piece of foam worn between the legs so a swimmer can float without kicking. It is used to increase the upper body workout. Kickboards are used to support the upper body, so a swimmer can focus on kicking. Lastly, hand paddles are used to create resistance to increase strength. Coach Dan Bullock points out that most swimmers are kicking too hard and too big. Kicking needs to be minimized, he says and kept within the profile of the body to decrease drag. It’s counterintuitive, because on land, larger stronger leg motions do lead to speed, but in water the main purpose of kicking is stabilization and create the right rotation, not propulsion. Any time you create drag (which large or wide kicks do) you are decreasing your speed, not increasing it. Most people’s kick is MUCH larger than they think it is, Dan warns. Remember the pendulum effect, just a tiny motion in the hips results in a huge kick at the feet. The final way to increase your swimming speed is to not swim. Swimmers who push themselves too hard for too long risk injury – especially to the rotator cuff. Balance your swimming with cross-training. Doing activities that use the legs (the largest muscle group) will increase cardiovascular health and increase your overall speed in the pool. Have you had any luck increasing your swimming speed? Do share!